April 22, 2016, Love the Earth You’re On! April 14, 2016—-In the past year or so, environmental events have changed the public perception of global warming and climate change. Not only have the majority of people now endorsed the fact that warming of the planet is real, but also that something must be done to stop the rapid change to the global system. Making a difference has become the action mode. Politicians around the world, regardless of their political or economic philosophy, are being forced to take action to curb the process. They are taking action because they must deal with the effects of global warming. Whether it is rising sea level, rising global temperatures, more frequent severe storms or changing weather patterns, the problems are real. Heads of state and mayors of major cities are now beginning to deal with these problems. On Saturday March 12, a global event took place called Earth Hour. The purpose of the event was to call attention to the rising impact of global warming and climate change. The first Earth Hour was held in Sydney, Australia on March 31, 2007. The World Wildlife Fund organization asked the people to turn off their lights for one hour to call attention to the increasing effects of global warming. More recently, on Saturday, March 12, billboards in Times Square in New York and lights on some buildings were dimmed or shut down from 8:30 to 9:00 p.m. Many other cities around the globe also participated. This year marked the tenth year of the event. 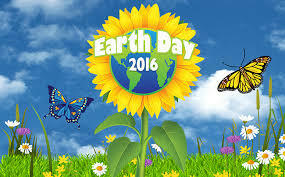 Earth Day 2016 promises to be a significant event. In December 2015, a conference was held in a suburb of Paris, France to discuss the necessary action to slow global warming. Attending were more heads of state than had ever before attended a single conference. The outcome? Nearly all of the countries presented plans to reduce greenhouse gases in the near future. This year on Earth Day, April 22, that group of over 190 governments have been invited by U.N. Secretary-General Ban Ki-Moon, to confirm the commitments they made in Paris by signing the agreement. The two largest greenhouse gas emitters, the United States and China, have agreed to sign. Unfortunately, most of the countries which participated in the Paris conference have not agreed to attend the UN signing. In order for the agreement to become a working document more countries, accounting for an additional 55% of greenhouse gases, must sign. It is extremely important that as many people as possible contact their representative leaders and encourage these countries to sign the agreement. Enacting this agreement would be a huge step forward in slowing greenhouse gas emissions and global warming! 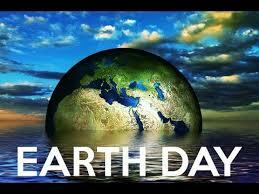 Agreement between China and U.S. will be signed on Earth Day 2016. Many global temperature records were broken in 2015 and the trend has continued into 2016. February continued a string of nearly a dozen straight months of record breaking monthly temperatures. Global average temperatures reached 56.08 degrees Fahrenheit which is 2.18 degrees above the average. The winter season, December through February, also set records. In February 2016 global temperatures were not only record breaking temperatures, but they rose drastically. Increases over the previous year were the highest since records began in 1880. In February of 2016, the arctic region experienced unusually warm average temperatures. In January 2016, land temperatures were 10oF (5.6OC) higher than the average, and in February 2016 they were 8 degrees F warmer (4.4 o C warmer). Warmer air temperatures in the arctic have had an enormous impact on ice cover in the arctic seas. 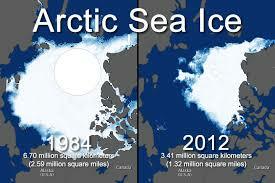 Normally, the lowest amount of ice cover in the Arctic occurs in September and the maximum in February. The warmer temperatures have melted the winter ice cover. Scientists began recording the extent of melting of the winter sea ice in 1979. The winter freezing of the ice set a record in 2015. This past February the area of sea ice was lower than in 2015, setting another new record. It is predicted that the Arctic could be entirely ice free in the next 20 years as greenhouse gases grow and the planet warms, resulting in even greater weather extremes in the Northern Hemisphere. Categories: Climate Change, Fossil Fuels, Sustainable Education | Tags: Arctic Ocean, Ban Ki Moon, Climate change, Disappearing Ice Shelves, Renewable Resources | Permalink.